August 24, 2018 Los Angeles Angels activated CF Mike Trout from the 10-day injured list. August 10, 2018 Los Angeles Angels placed CF Mike Trout on the 10-day disabled list retroactive to August 6, 2018. Right wrist inflammation. July 14, 2017 Los Angeles Angels activated CF Mike Trout from the 10-day disabled list. July 5, 2017 Los Angeles Angels sent CF Mike Trout on a rehab assignment to Inland Empire 66ers. April 28, 2012 Los Angeles Angels recalled Mike Trout from Salt Lake Bees. 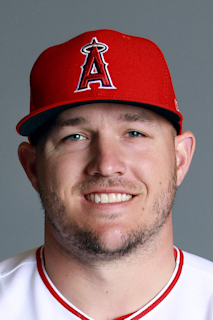 March 30, 2012 Los Angeles Angels optioned Mike Trout to Salt Lake Bees. August 19, 2011 Los Angeles Angels recalled Mike Trout from Arkansas Travelers. August 1, 2011 Los Angeles Angels optioned Mike Trout to Arkansas Travelers. July 8, 2011 Los Angeles Angels selected the contract of Mike Trout from Arkansas Travelers. April 4, 2011 Mike Trout assigned to Arkansas Travelers from Inland Empire 66ers. January 28, 2011 Los Angeles Angels invited non-roster CF Mike Trout to spring training. July 13, 2010 CF Mike Trout assigned to Rancho Cucamonga Quakes from Cedar Rapids Kernels. July 10, 2010 Mike Trout roster status changed by Cedar Rapids Kernels. March 20, 2010 CF Mike Trout assigned to Los Angeles Angels. September 1, 2009 CF Mike Trout assigned to Cedar Rapids Kernels from AZL Angels. July 5, 2009 AZL Angels signed Mike Trout. July 1, 2009 Los Angeles Angels signed OF Mike Trout.